Even a little something called summer break didn’t stop UW CEE students from honing their engineering skills. It was a busy summer for many undergraduates who decided to use their time off from school to pursue internships with a variety of companies. From working on a light rail system in Hawaii to the Elliott Bay Seawall Project in Seattle, several undergraduate seniors advanced their skills with real-world experience. Completed a variety of projects related to the carrying capacity of commercial airplane models. Worked on the Elliott Bay Seawall Project to replace an aging seawall that spans Seattle’s waterfront. Helped oversee the crew that is building the first light rail system in Honolulu County, Oahu, Hawaii. Worked on a variety of structural engineering based military projects. This entry was posted in Uncategorized on October 31, 2016 by ceenews. 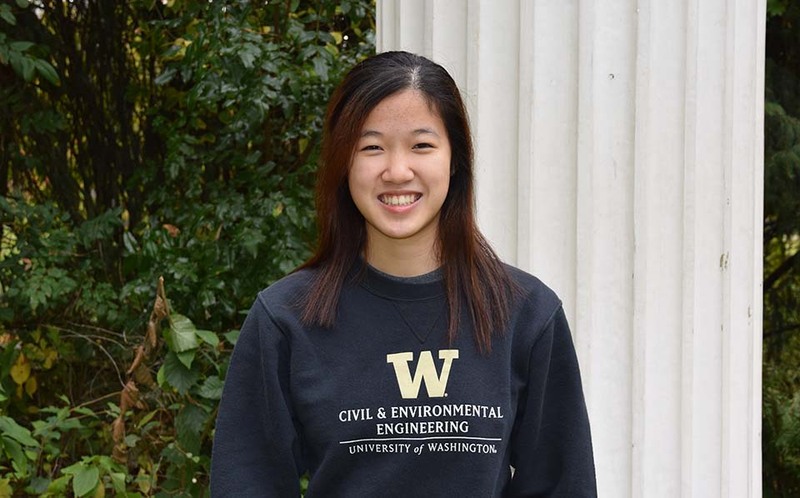 UW CEE senior Iris Kwong. Senior Iris Kwong always thought she would enjoy a career in structural engineering. Thanks to her summer internship, that thought has been validated. Kwong spent the summer interning with BergerABAM, located in Federal Way, Wash. As a structural engineering intern in the buildings group, she worked primarily on military based projects, a few of which were at Joint Base Lewis-McChord. The team’s projects included designing a tactical force center and retrofitting buildings on the military base. During the internship, Kwong worked closely with other engineers, assisting them with a variety of projects, such as creating simplified structural calculations packages, visiting project sites to evaluate the status of construction and assisting with proposal and design narratives for upcoming projects. Kwong honed a variety of skills and became more familiar with various codes and manuals that are frequently used in industry. She also learned how to use one of the most common Building Information Modeling software tools, Revit. Due to not having taken senior courses yet, Kwong was able to get up-to-speed on various skills through on-the-job learning. Following graduation, Kwong plans to pursue a master’s degree, followed by a career in structural engineering focusing on either high rises or bridges with an emphasis of prestressed concrete. If her name sounds familiar, Kwong is also involved in the concrete canoe team, serving as captain of the team this year. 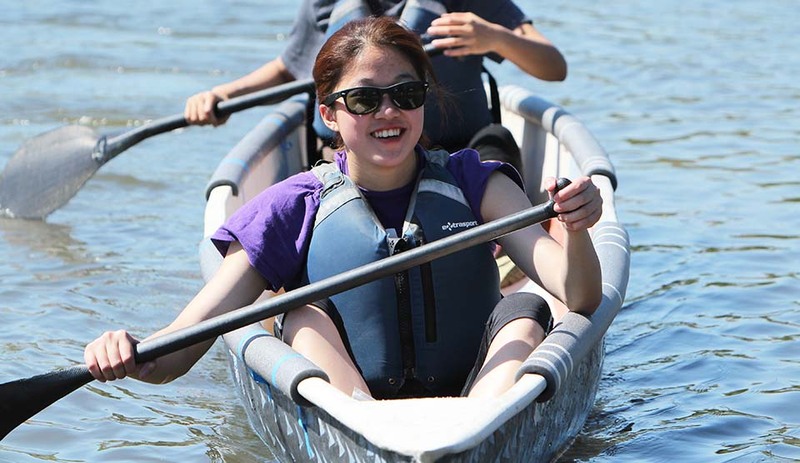 UW CEE senior Iris Kwong is captain of the concrete canoe team. UW CEE senior Shadin Khreis. 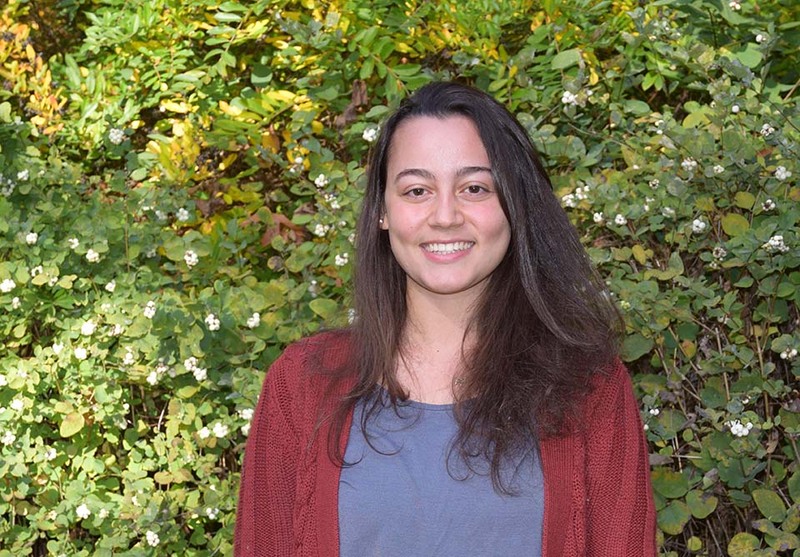 Like many college students, senior Shadin Khreis spent her summer near the water. She, however, was busy working on the Elliott Bay Seawall Project during an internship with the Jacobs Engineering Group. 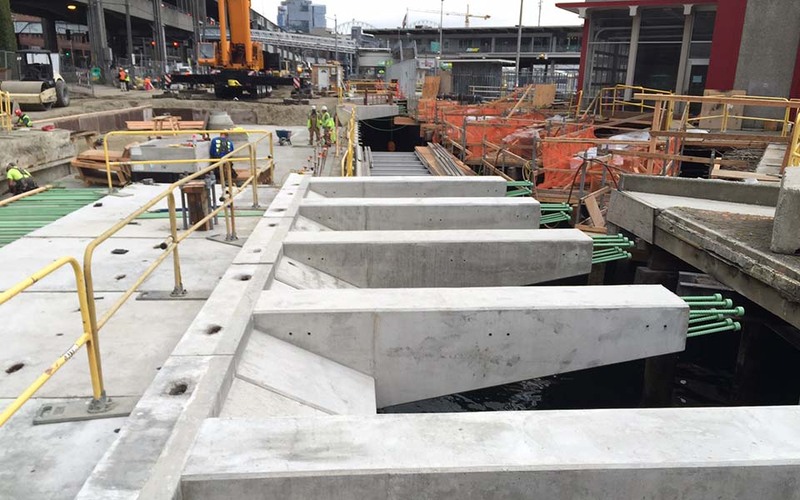 The project entails replacing an aging seawall that spans Seattle’s waterfront. The original seawall, from the 1930s, was quickly deteriorating and vulnerable to seismic hazards. Anticipated to be completed in 2017, the new seawall will protect infrastructure by meeting seismic standards and enhances the habitat for salmon migration. As part of the construction management team, Khreis assisted the senior site inspector with conducting inspections, which entailed examining traffic control plans, curbs and gutters, roadway compaction, concrete pours and rebar installation. Khreis reported the results through daily inspector reports that she compiled. Pre-cast zee panels installed by the fire station connect the street to the pier, which will support the light penetrating surface panels to be installed at a later date. Khreis also assisted with reporting the progress of ongoing construction and detailing safety issues. She participated in safety walks with the Seattle Department of Transportation as well as environmental walks to ensure that the contractors complied with environmental regulations. The environmental walks entailed looking for oil leaks from machinery and any debris from the construction site that could end up in the water. Other duties included reporting the number of people working on different tasks, monitoring how long it took to complete tasks and noting any materials received. Khreis also attended daily meetings with the general contractor/construction manager to discuss tasks and progress. Becoming more familiar with construction in general was one of the most beneficial parts of the internship, said Khreis. Following graduation, Khreis plans to earn her master’s degree in structural engineering followed by a career in the field. UW CEE senior Lynden Dowell. Senior Lynden Dowell left Seattle for even sunnier skies this past summer. Hired as a field engineering intern at Kiewit Corporation, Dowell helped oversee a construction crew that is building the first light rail system in Honolulu County, Oahu, Hawaii. 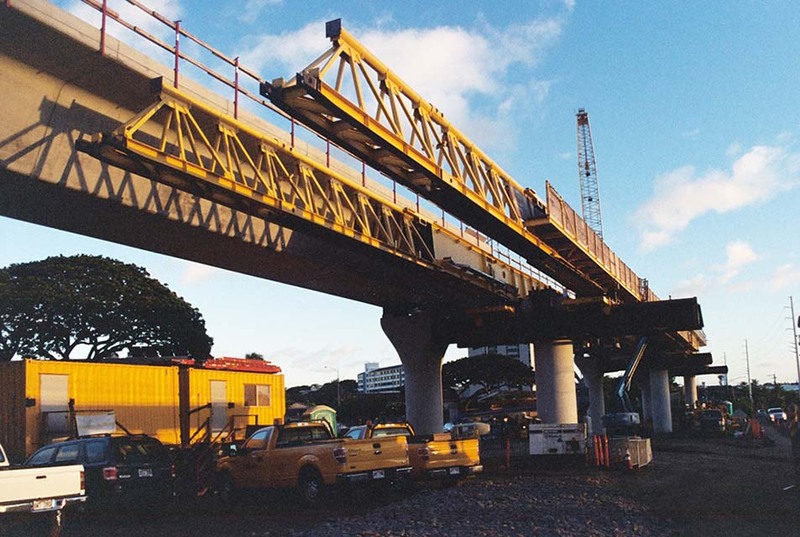 The Honolulu Rail Transit Project entails building 11 miles of elevated roadway and the hard-to-miss job site stretches five miles along the six-lane Kamehameha Highway. The objective of the project is to alleviate congestion by providing a transportation alternative for both locals and tourists. As a field engineering intern, Dowell worked the night shift. Between sunset and sunrise each day, he worked with a team that was responsible for hoisting precast concrete segments into position and running cables through the span of concrete segments and stressing them to a total of eight million pounds of force. 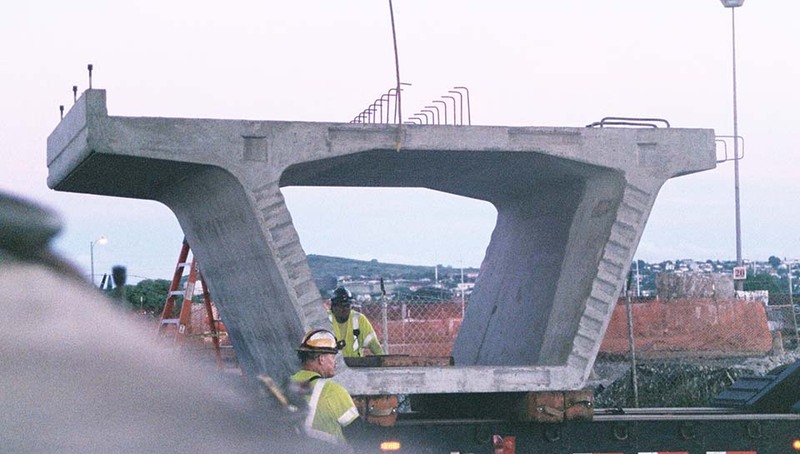 Girders support the precast segments while they are set and post-tensioned. After first integrating himself with the team, which had been operational for more than a year, Dowell learned about basic procedures, such as safety practices implemented at a heavy construction site. He also worked closely with the field engineer to learn how to divide the crew and resources to complete each task as efficiently and quickly as possible. “I quickly realized that each construction site has its own specific methods, equipment and way of getting things done,” Dowell said. Lessons that he took away include the importance of communication between various upper-level managers, as well as the importance of being able to interact with the crew and physically assist with the work. Although working long hours during the week, Dowell enjoyed sightseeing on the weekends. After buying a second-hand bicycle his second day on the island, he became comfortable riding along various trails and roads, exploring the “endless valleys and beaches of the emerald gem” where he spent his summer. Precast segment staged for lifting onto the girders. UW CEE senior Begum Birsoz. 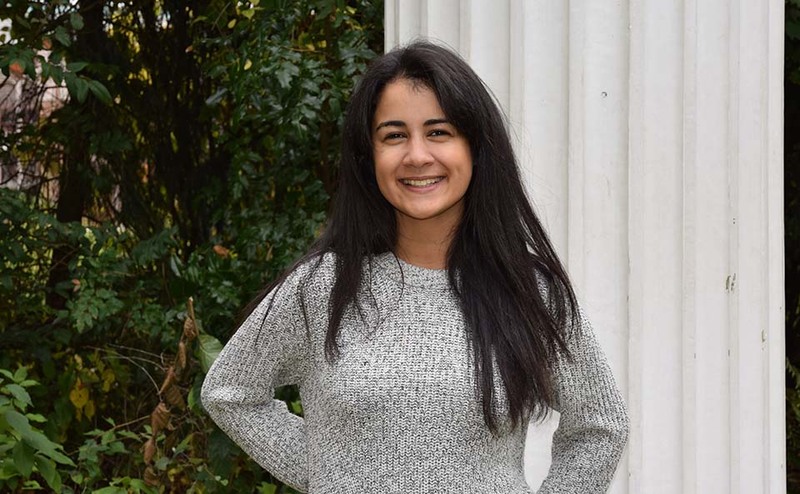 While keeping both feet on the ground, senior Begum Birsoz’s summer revolved around airplanes. As an intern at The Boeing Company in Everett, Wash., Birsoz spent three months working as a payloads design engineering intern, where she completed a variety of projects related to the carrying capacity of commercial airplane models. With a need for engineers from all disciplines, Boeing is full of opportunities for civil engineers, Birsoz said. In just three months’ time, Birsoz gained a fundamental understanding of requirement-based design engineering, which entails determining user expectations prior to designing new features. The assignments were often not fully defined, Birsoz said, which prompted her to think outside the box. New projects required a number of steps, including defining the problem, brainstorming and discussions with experts on various topics. “I realized the difference from working on engineering problems from college course assignments, where detailed directions lead to definite answers,” Birsoz said. Throughout the internship, Birsoz was mentored by UW CEE alumnus Wade Price (CEE ‘81), an Associate Technical Fellow at Boeing. She also worked alongside fellow intern Renee Engleson, a UW CEE senior. Price provided guidance and constructive feedback during every step, Birsoz said. The internship also gave Birsoz an opportunity to hone her communication skills. After preparing the training, she and Engleson delivered a technical presentation to more than 30 seat design engineers. 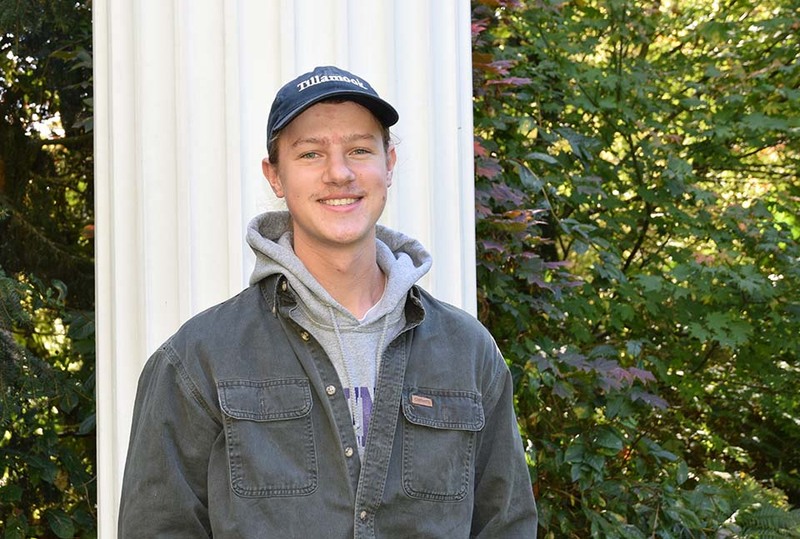 Birsoz learned about the internship opportunity during a UW CEE department information session last fall. Chair Greg Miller announces the launch of the UW giving campaign and challenges 50 percent of alumni to participate. UW CEE alumni excel in team spirit! 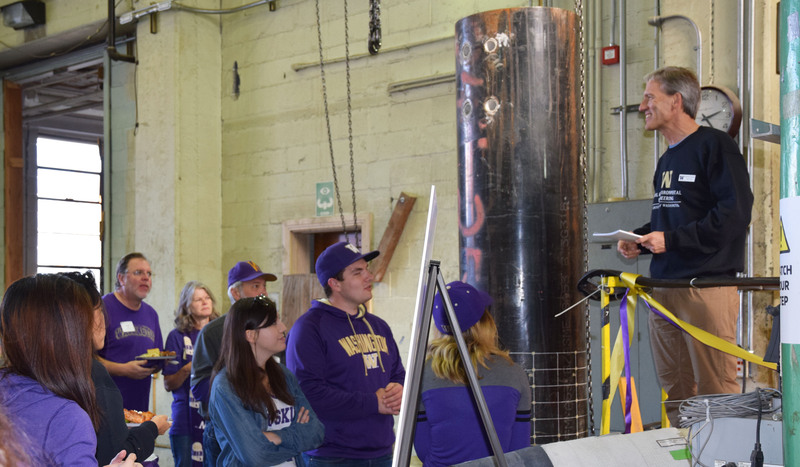 More than 100 UW CEE alumni and guests gathered for a tailgate party before the Huskies’ homecoming game against Oregon State University on Saturday, October 22. Held in a new location this year, the Structural Research Laboratory, attendees enjoyed food and drinks (served out of a concrete canoe!) and reconnected with colleagues, former classmates, friends and faculty. To learn more about supporting UW CEE, please visit www.ce.washington.edu/alumni/give.html. This entry was posted in Uncategorized on October 28, 2016 by ceenews. Depending on your ethnicity and gender, Uber or Lyft might not be such a quick ride. 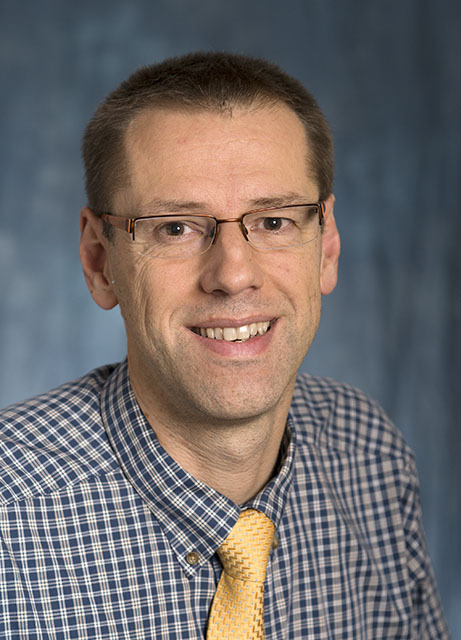 A team of researchers including CEE Assistant Professor Don MacKenzie has found that discrimination impacts the quality of transportation for many people who utilize Transportation Network Companies (TNCs) such as Uber and Lyft. The research findings come in two waves. The first paper, published in the October edition of the Journal of Transport Geography, compared Uber service across Seattle neighborhoods, finding that estimated wait times for an UberX tended to be shorter in lower-income neighborhoods of Seattle. While this was encouraging news, the researchers wanted to delve deeper into other forms of discrimination, to evaluate whether equitable service was provided. To do so, MacKenzie and fellow researcher Ryan Hughes (MSCEE ’15) collaborated with researchers from MIT and Stanford University on additional studies to investigate discrimination within TNCs in other cities. According to the researchers, there are four opportunities for discrimination to occur. One of these, drivers avoiding certain neighborhoods, was addressed in the first paper. The remaining discrimination challenges were assessed in the second paper: drivers declining trip requests from certain passengers or canceling requests after accepting them, drivers taking certain passengers on longer routes and drivers leaving lower star ratings for some passengers. The second paper, published shortly after the first paper as a working paper, uncovered several forms of discrimination. Data was collected by sending out teams of UW and MIT undergraduate students to request and take rides on pre-assigned routes in Seattle and Boston. The researchers based in Seattle found significantly longer average times for black travelers to get an UberX or Lyft trip request accepted and significantly longer waiting times for black passengers to be picked up by their UberX. The researchers in Boston found discrimination against travelers with “black” names and that females were taken on significantly longer routes than males for the same destination. To learn more details about the research, see MacKenzie’s blog post. This entry was posted in Uncategorized on October 25, 2016 by ceenews. SCTL Center Director and CEE Associate Professor Anne Goodchild. From dinner to designer shoes, an increase in online shopping might seem like a win-win for both retailers and customers. However, transporting goods to customers quickly and inexpensively has become a struggle for many retailers that are trying to meet customer demands in a relatively new online marketplace. To address this pressing problem, the newly launched Supply Chain Transportation and Logistics (SCTL) Center has partnered with retailers Costco, Nordstrom and UPS, as well as the Seattle Department of Transportation, to devise solutions to better deliver goods throughout the city. The SCTL is the first center of its kind in the Pacific Northwest. To celebrate the grand opening of the SCTL, more than 50 transportation experts from the region gathered on the morning of October 12, 2016, to learn more about the partnership and initial projects that will soon be underway. The research will be conducted in the Urban Freight Lab, which is part of the SCTL Center. 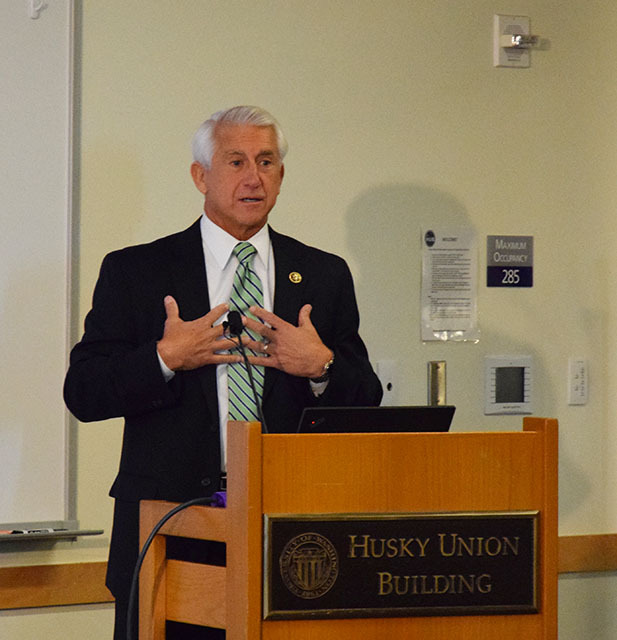 At the opening event, Congressman Dave Reichert, who co-chairs the Congressional Freight Caucus, expressed this enthusiasm for the new center. Seattle is a leader in how goods move throughout the region and across the nation, he said, as more than 70 percent of the goods received at the port are shipped elsewhere, with only 30% remaining in the city. One of the first projects the researchers will tackle is called the “final 50 feet,” which is the last leg of delivery, the point where the delivery drivers parks their vehicle to complete the final delivery step. The researchers will create a map of loading zones and alleys to determine how delivery systems are currently functioning and will test a variety of solutions such as managing curb space differently. The team will eventually create an Urban Freight Score to evaluate the ability of trucks to access various locations throughout the city. View photos from the opening event. This entry was posted in Uncategorized on October 12, 2016 by ceenews. A paper authored by an alum and three UW CEE faculty members has received a best paper prize from the international geoengineering research journal Acta Geotechnica. The paper was one of the most cited papers published in Acta Geotechnica in 2015. 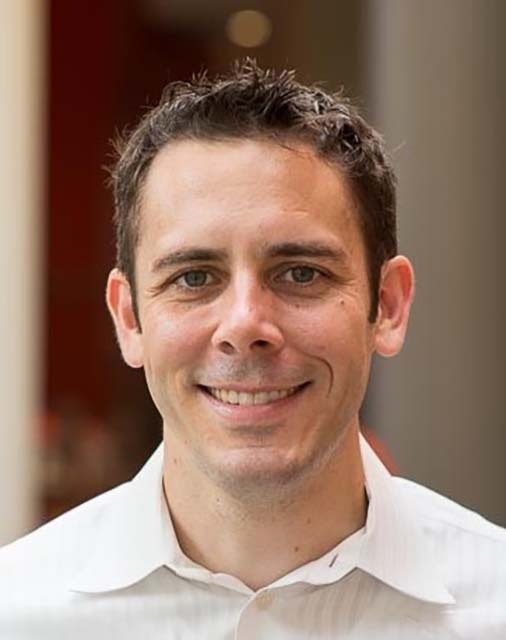 Lead author for the paper “Simulating granular column collapse using the Material Point Method” is alum Carter Mast (Ph.D. ’13), who currently works at Amazon as a software development engineer. Co-authors are geotechnical faculty member Pedro Arduino and structural faculty members Peter Mackenzie-Helnwein and Gregory Miller. “The paper is the result of excellent cooperation between structural and geotechnical faculty and students,” Arduino said. The paper presents an analysis of sand column collapse phenomena using the Material Point Method (MPM), which is used to simulate the behavior of materials such as liquids and gases, together with a constitutive model to capture how the sand responds to various loadings. While the technique is not new, this is the first time it has been applied to granular materials, which are difficult to analyze using alternative methods. The researchers conducted a series of numerical simulations of two dimensional sand column collapse configurations and compared their results with other simulations and experimental results, proving the MPM analysis method produced more accurate results. From a computational standpoint, consistently modeling and capturing the variability of granular materials is challenging. This is because the material parameters are highly variable and are influenced by many factors, such as moisture content. The constitutive model, which links the deformed material to the stress in the material, is also problematic in the context of granular materials as properly capturing variables requires extensive model calibration from lab samples. Using this research as a benchmark, future applications may entail utilizing the MPM to model the interaction between a flowing medium and structural support, Mast said, such as a flowing landslide and columns supporting a bridge. This entry was posted in Uncategorized on October 6, 2016 by ceenews. 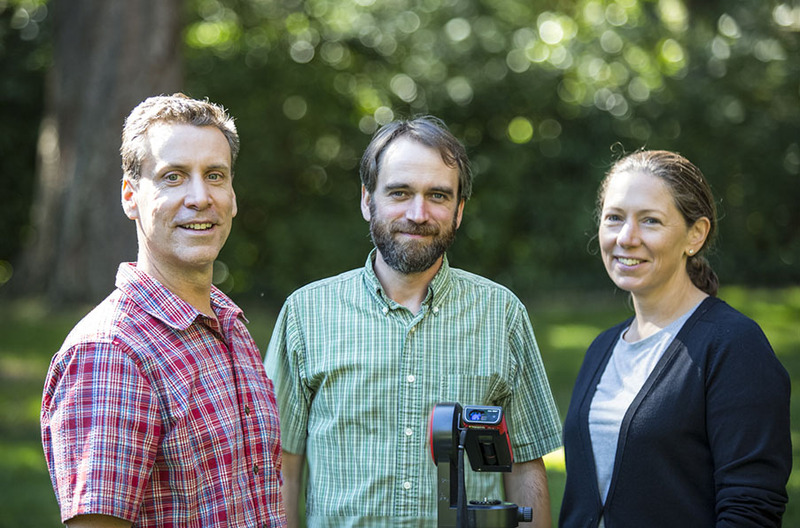 Setting up high-resolution survey equipment that will be used in the new Post-Disaster Rapid Response Research Facility is the faculty team from CEE: Principal Investigator Joe Wartman, Jeffrey Berman and Laura Lowes, from left. The silver lining for natural disasters is that they provide a learning opportunity and a chance to reduce damages incurred in future catastrophes. With this objective, a five-year $4.1 million Natural Hazards Engineering Research Infrastructure (NHERI) grant from the National Science Foundation (NSF) funds a new disaster investigation center at the University of Washington, called the Post-Disaster Rapid Response Research Facility. Led by UW Civil & Environmental Engineering faculty, the center will enable the collection, assessment and archiving of high-quality data in the aftermath of disasters, which will be used to develop more resilient communities. 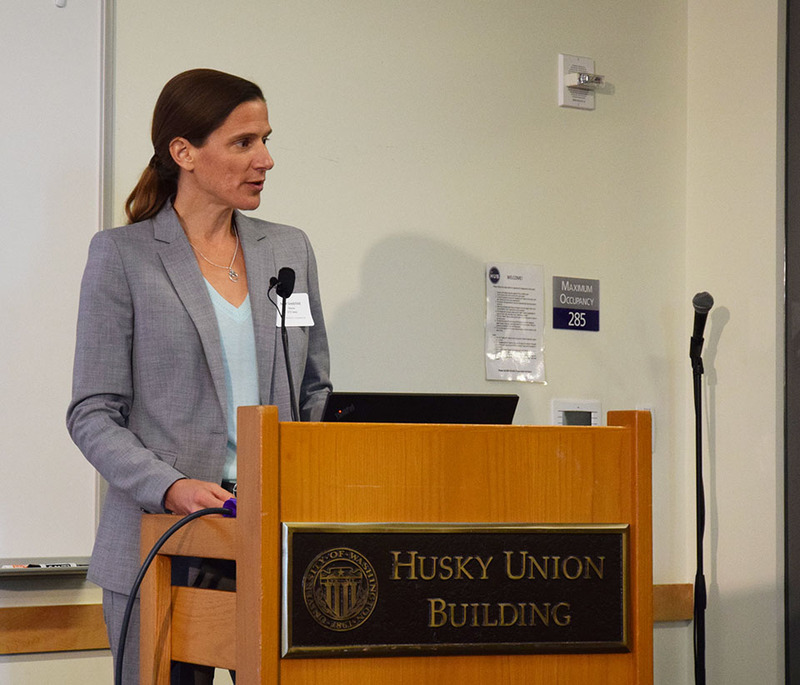 Located in UW’s Department of Civil & Environmental Engineering, the new center will headquarter data collection in the aftermath of two types of natural disasters: wind hazards, such as tornadoes and coastal storms, and earthquakes, which includes earthquake-induced tsunamis. The shared-use facility will be open to UW researchers as well as the broader research community across the nation. The center will offer not only tools and data collection equipment, but ongoing support and guidance for research teams deploying to disaster sites. Data will be carefully collected, stored and shared as open-source data with the broader research community, prompting the evaluation of infrastructure performance through natural hazards simulation and modeling in order to develop more resilient communities. 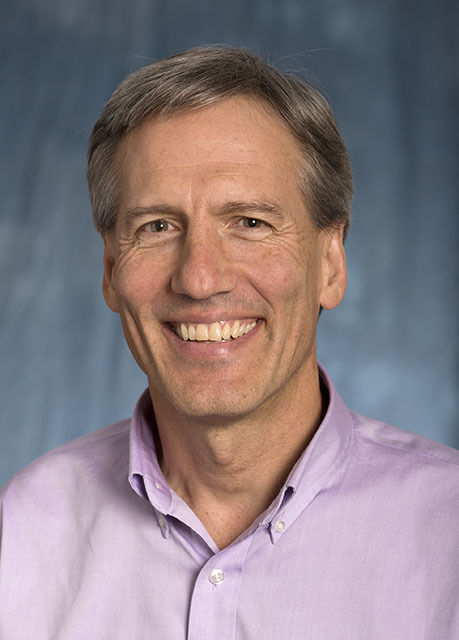 Led by Wartman, the new center includes an interdisciplinary faculty team from UW and other universities. UW participants include co-investigator and Civil & Environmental Engineering Associate Professor Jeffrey Berman, Civil & Environmental Engineering Professor Laura Lowes, Human Centered Design & Engineering Senior Principal Research Scientist Scott Miles, Evans School of Public Policy Professor Ann Bostrom and Applied Physics Laboratory Senior Research Scientist Troy Tanner. The center’s leadership team also includes faculty from the University of Florida, Oregon State University and Virginia Polytechnic Institute and State University. The new center comes at a time when total losses from natural disasters are increasing yearly. With the concentration of urban communities, natural disasters make cities increasingly vulnerable. The damage incurred world-wide from natural disasters that occurred between 1980-2014 is estimated at $4.2 trillion, according to World Bank. Within this timeframe, losses escalated rapidly, starting at about $50 billion per year in the 1980s and reaching almost $200 billion by 2014. The new center builds on UW CEE faculty’s collective expertise with post-disaster data collection and analysis. 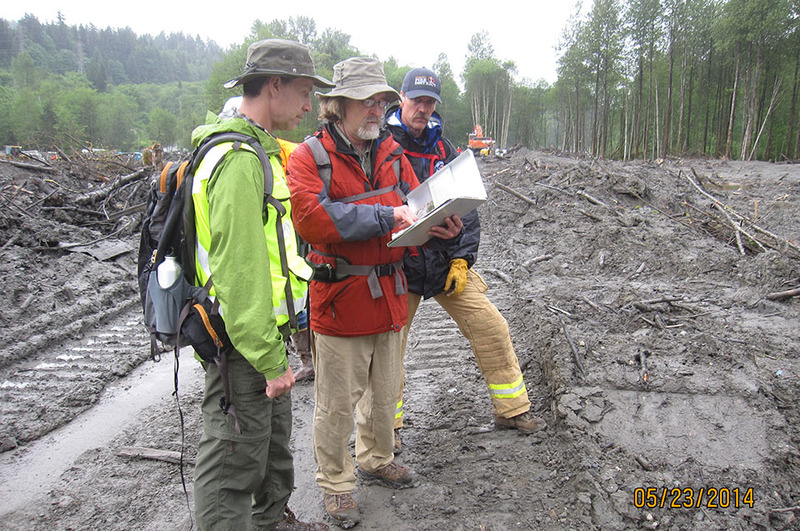 Wartman led a team of NSF-sponsored researchers to collect data and document conditions following the 2014 Oso Landslide, the deadliest landslide in the history of the United States, and also gathered data in the aftermath of the 2011 Christchurch Earthquake. 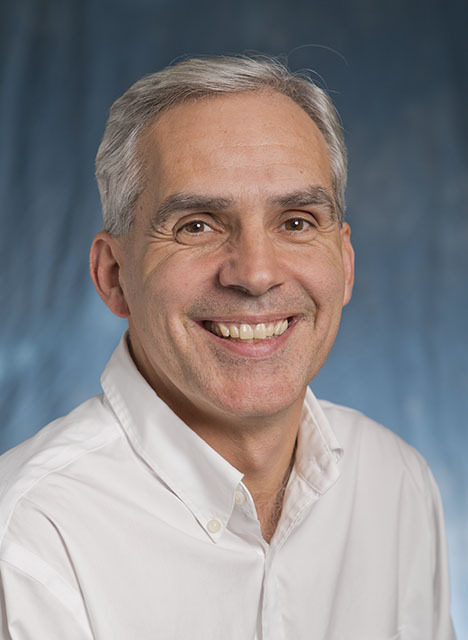 Berman’s current work includes NSF-funded research to develop new seismic load resisting systems to minimize post-earthquake repair costs and investigating impacts of a Cascadia Subduction Zone Earthquake on the Pacific Northwest. The center will include state-of-the-art data collection tools, such as technology to gather geographic information, aerial photography, laser scanning equipment, seismological instruments, unmanned aircraft systems such as drones, and a 3D visualization lab for researchers to view and analyze images gathered during field work, allowing them to essentially see the disaster scene as if they were there. Additional tools will also be developed, specific to the data gathering objective, such as an app that allows people to provide feedback on damage incurred during earthquakes. Several CEE faculty are also involved in two related NHERI centers. Professor Laura Lowes and Professor Pedro Arduino are members of the management team for the cyberinfrastructure component, DesignSafe-CI, headquartered at the University of Texas at Austin. The Web-based data repository will be used by the various NHERI research teams to share and archive information, as well as provide tools to analyze and report research findings. A second related center, the Computational Modeling and Simulation Center (SimCenter), is co-led by Lowes and includes faculty members Arduino, Michael Motley and Peter Mackenzie-Helnwein. Based at the University of California, Berkeley, the SimCenter’s goal is to transform natural hazards simulation in order to better assess regional risks. The ability to better simulate the damage caused by natural disasters will empower communities to make better-informed decisions about disaster preparation. This entry was posted in Uncategorized on October 5, 2016 by ceenews.